Decorating spooky gingerbread shapes. We start with a brief demonstration on preparing, cutting and baking the gingerbread cookies. 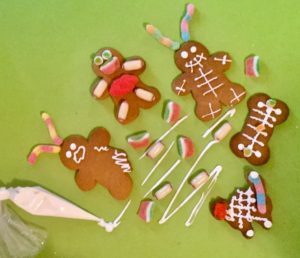 Each child will choose four shapes and with their own icing bags begin to create spooky cookies, adding weird and wonderful lollies. While the cookies dry, its time to have a snack and a wee run around. Your cookies will be bagged ready take home to scare your family. Loulou owned her own Catering and event management business and organised functions, kids parties and weddings. Learn how to create the perfect gingerbread cookie and houses. Create fabulous fondant cookies for all. Loulou will be also holding workshops in Macrame, making hangers and fabulous garden swings. Her favourite things, cooking of course, writing, sketching, photography and collecting vintage.